e commerce – Latest Venture news. Fastly, the content delivery network that’s raised $219 million in financing from investors (according to Crunchbase), is ready for its close up in the public markets. The eight-year-old company is one of several businesses that improve the download time and delivery of different websites to internet browsers and it has just filed for an IPO. Media companies like The New York Times use Fastly to cache their homepages, media and articles on Fastly’s servers so that when somebody wants to browse the Times online, Fastly’s servers can send it directly to the browser. In some cases, Fastly serves up to 90 percent of browser requests. E-commerce companies like Stripe and Ticketmaster are also big users of the service. They appreciate Fastly because its network of servers enable faster load times — sometimes as quickly as 20 or 30 milliseconds, according to the company. The company raised its last round of financing roughly nine months ago, a $40 million investment that Fastly said would be the last before a public offering. True to its word, the company is hoping public markets have the appetite to feast on yet another “unicorn” business. While Fastly lacks the sizzle of companies like Zoom, Pinterest or Lyft, its technology enables a huge portion of the activities in which consumers engage online, and it could be a bellwether for competitors like Cloudflare, which recently raised $150 million and was also exploring a public listing. The company’s public filing has a placeholder amount of $100 million, but given the amount of funding the company has received, it’s far more likely to seek closer to $1 billion when it finally prices its shares. Fastly reported revenue of roughly $145 million in 2018, compared to $105 million in 2017, and its losses declined year on year to $29 million, down from $31 million in the year-ago period. So its losses are shrinking, its revenue is growing (albeit slowly) and its cost of revenues are rising from $46 million to around $65 million over the same period. That’s not a great number for the company, but it’s offset by the amount of money that the company’s getting from its customers. Fastly breaks out that number in its dollar-based net expansion rate figure, which grew 132 percent in 2018. It’s an encouraging number, but as the company notes in its prospectus, it’s got an increasing number of challenges from new and legacy vendors in the content delivery network space. Reese Witherspoon’s media company Hello Sunshine already has its hands in movies, television, Apple TV+ shows, podcasts, Audible originals, books and more. Now it’s weighing an entry into the subscription box business to further capitalize on its brand and its appeal to women. The subscription boxes under consideration would operate out of Reese’s Book Club — the curated selection of book recommendations whose focus is on titles with strong female leads. The club, which some believe may one day rival Oprah’s, is already capable of driving sales at Amazon and elsewhere. It’s also now a feeder into other Hello Sunshine projects — like HBO’s “Big Little Lies,” Hulu’s upcoming adaptation of “Little Fires Everywhere” and others. Now the company is gathering feedback as to how to turn the book club’s online brand — which began with Witherspoon posting books to Instagram — into a revenue-generating business of its own. Hello Sunshine members recently received a survey asking for their feedback about Hello Sunshine and Reese’s Book Club. But the questions it posed were almost entirely focused on gathering information about what members would want to see in a subscription box. For example, would they prefer items that are seasonal, themed to the book club’s current pick or those that are related to reading — like book lamps and bookmarks? Or would members be open to anything Reese just likes herself, for whatever reason? To some extent, Hello Sunshine has already begun the process of curating other non-book items through the site’s online shop, where it features things like totes, mugs, pins, hats, notebooks, makeup bags and even jewelry. These could easily be added into subscription boxes, if the time comes. The survey also asked for feedback about how the books would be paired with the other items. Members were asked if they would prefer the monthly book club selection or themed boxes like “favorite books,” “classics” or “summer reads,” for example. Finally, the survey asked about how customers would like to pay — monthly, quarterly, annually and so on. While the larger subscription box craze may have passed, many that have a more female-friendly focus are still surviving — like Birchbox and Ipsy’s makeup boxes, jewelry focused Rocksbox, FabFitFun and others. And some are even thriving — like Stitch Fix’s subscription-based clothing boxes. Hello Sunshine’s potential in this space would instead come from its growing fan base, rather than something it has to start from scratch. Today the book club has 1 million Instagram followers, up from 390,000 a year ago. That’s in addition to the 471,000 who follow Hello Sunshine and the 17.3 million who follow Witherspoon. Hello Sunshine did not return requests for comment. Back in January, Sequoia India announced plans for its first early-stage startup accelerator program in India and Southeast Asia, and today the firm announced its first cohort of 17 startups. To recap, the program — which is called Surge — gives each startup a $1.5 million check and participation in a four-month program that’s split across India and Singapore, as well as the wider Sequoia global presence in China and San Francisco. There’s one additional startup which is being kept ‘under the radar’ for now, Sequoia said. Sequoia India managing director Shailendra Singh previously told TechCrunch that Surge would support a ‘curated’ selections of fellow VCs who could invest alongside in the cohort alongside the firm, and Sequoia said that the 17 startups have attracted a total of $36 million in investment. A spokesperson also pointed out that five of the selection have at least one female co-founders, which is almost certainly above average for the region although it is tricky to get reliable data covering India and (in particular) Southeast Asia. Surge is an interesting effort for Sequoia, which has traditionally played in post-seed and growth stages of the investment cycle. Sequoia closed its most recent fund for India and Southeast Asia at $695 million last year, and it also has access to a globally active ‘growth’ fund that is targeted at $8 billion. Reports have suggested that Surge will get its own sparkling new $200 million fund, which would make a lot of sense given the potential conflict and confusion of investing via its main fund. But the firm is declining to comment on that possibility for now. One major addition to the program that has been confirmed, however, is Rajan Anandan, the executive who previously ran Google’s business in India and Southeast Asia and is a well-known angel investor. His arrival was announced earlier this month and he will lead the Surge initiative. His recruitment is a major win for Sequoia, which is betting that Surge’s early stage push will reap it richer dividends in India and Southeast Asia. That part remains to be seen, but certainly, there is a dearth of early-stage programs in both regions compared to other parts of the world. Netflix’s new production hub will include an expanded Manhattan office and six sound stages in Brooklyn that could bring in hundreds of executive positions and thousands of production crew jobs to New York within the next five years, according to a statement from the Empire State Development Corp.
To sweeten the pot for Netflix, the Empire State Development Corp. has offered $4 million in performance-based Excelsior Tax Credits over ten years, which the corporation says are tied to real job creation. To receive the incentive, Netflix must create 127 jobs by 2024 at its executive production office and retain those jobs for another five years. Aaron Rinberg is an associate with Battery Ventures in Herzliya, Israel. Scott Tobin is a general partner with Battery Ventures in Herzliya, Israel. If you think physical retail is dead, you couldn’t be more wrong. Despite the explosion in e-commerce, we’re still buying plenty of stuff in offline stores. In 2017, U.S. retail sales totaled $3.49 trillion, of which only 13 percent (about $435 billion) were e-commerce sales. True, e-commerce is growing at a much faster annual pace. But we’re still very far from the tipping point. Amazon, the e-commerce giant, is playing an even longer game than everyone thinks. The company already dominates online retail — Amazon accounted for almost 50 percent of all U.S. e-commerce dollars spent in 2018. But now Amazon is eyeing the much bigger prize: modernizing and dominating retail sales in physical locations, mainly through the use of sophisticated data analysis. The recent reports of Amazon launching its own chain of grocery stores in several U.S. cities — separate from its recent Whole Foods acquisition — is just one example of how this could play out. You can think of this as the Amazon one-two punch: The company’s vast power in e-commerce is only the initial, quick jab to an opponent’s face. Data-focused innovations in offline retail will be Amazon’s second, much heavier cross. Traditional retailers too focused on the jab aren’t seeing the cross coming. But we think canny retailers can fight back — and avoid getting KO’d. Here’s how. Physical storage of goods has long been crucial to advances in commerce. Innovations here range from Henry Ford’s conveyor belt assembly line in 1910, to IBM’s universal product code (the “barcode”) in the early 1970s, to J.C. Penney’s implementation of the first warehouse management system in 1975. Intelligrated (Honeywell), Dematic (KION), Unitronics, Siemens and others further optimized and modernized the traditional warehouse. But then came Amazon. After expanding from books to a multi-product offering, Amazon Prime launched in 2005. Then, the company’s operational focus turned to enabling scalable two-day shipping. With hundreds of millions of product SKUs, the challenge was how to get your pocket 3-layer suture pad (to cite a super-specific product Amazon now sells) from the back of the warehouse and into the shippers’ hands as quickly as possible. Make no mistake: Amazon’s one-two retail punch will be formidable. Amazon met this challenge at a time when automated warehouses still had massive physical footprints and capital-intensive costs. Amazon bought Kiva Systems in 2012, which ushered in the era of Autonomous Guided Vehicles (AGVs), or robots that quickly ferried products from the warehouse’s depths to static human packers. Since the Kiva acquisition, retailers have scrambled to adopt technology to match Amazon’s warehouse efficiencies. 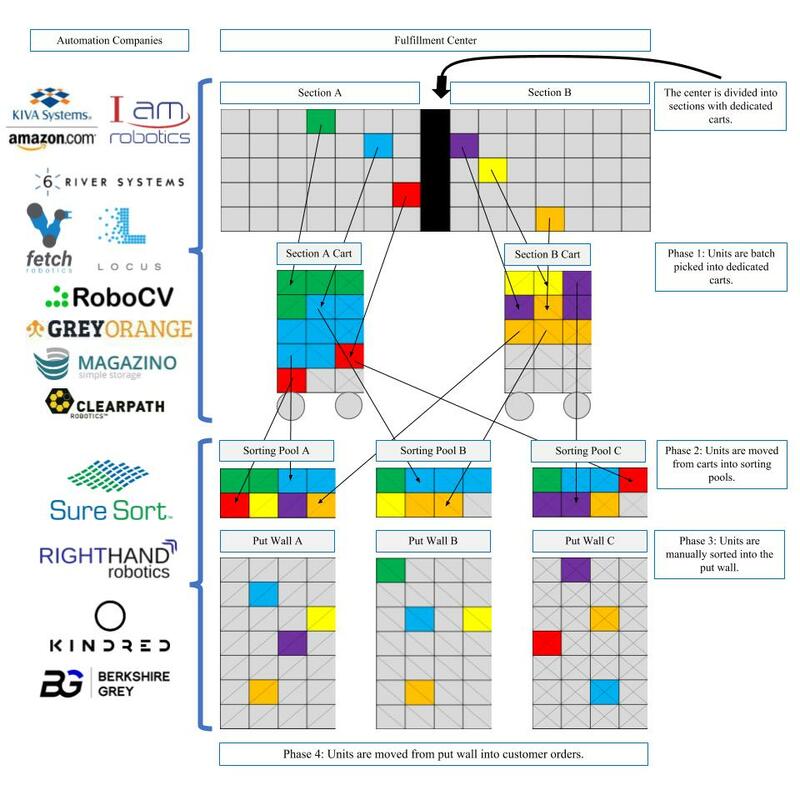 These technologies range from warehouse management software (made by LogFire, acquired by Oracle; other companies here include Fishbowl and Temando) to warehouse robotics (Locus Robotics, 6 River Systems, Magazino). Some of these companies’ technologies even incorporate wearables (e.g. ProGlove, GetVu) for warehouse workers. We’ve also seen more general-purpose projects in this area, such as Google Robotics. The main adopters of these new technologies are those companies that feel Amazon’s burn most harshly, namely operators of fulfillment centers serving e-commerce. It’s impossible to say what optimizations Amazon will bring to warehousing beyond these, but that may be less important to predict than retailers realize. Amazon has made several recent forays into offline shopping. These range from Amazon Books (physical book stores), Amazon Go (fast retail where consumers skip the cashier entirely) and Amazon 4-Star (stores featuring only products ranked four-stars or higher). Amazon Live is even bringing brick-and-mortar-style shopping streaming to your phone with a home-shopping concept à la QVC. Perhaps most prominently, Amazon’s 2017 purchase of Whole Foods gave the company an entrée into grocery shopping and a nationwide chain of physical stores. Most retail-watchers have dismissed these projects as dabbling, or — in the case of Whole Foods — focused too narrowly on a particular vertical. But we think they’re missing Bezos’ longer-term strategic aim. Watch that cross: Amazon is mastering how physical retail works today, so it can do offline what it already does incredibly well online, which is harness data to help retailers sell much more intelligently. Amazon recognizes certain products lend themselves better to offline shopping — groceries and children’s clothing are just a few examples. How can traditional retailers fight back? Get more proactive. Those shopping experiences are unlikely to disappear. But traditional retailers (and Amazon offline) can understand much, much more about the data points between shopping and purchase. Which path did shoppers take through the store? Which products did they touch and which did they put into a cart? Which items did they try on, and which products did they abandon? Did they ask for different sizes? How does product location within the store influence consumers’ willingness to buy? What product correlations can inform timely marketing offers — for instance, if women often buy hats and sunglasses together in springtime, can a well-timed coupon prompt an additional purchase? Amazon already knows answers to most of these questions online. They want to bring that same intelligence to offline retail. Obviously, customer privacy will be a crucial concern in this brave new future. But customers have come to expect online data-tracking and now often welcome the more informed recommendations and the convenience this data can bring. Why couldn’t a similar mindset-shift happen in offline retail? How can retailers fight back? Make no mistake: Amazon’s one-two retail punch will be formidable. But remember how important the element of surprise is. Too many venture capitalists underestimate physical retail’s importance and pooh-pooh startups focused on this sector. That’s extremely short-sighted. Does the fact that Amazon is developing computer vision for Amazon Go mean that alternative self-checkout companies (e.g. Trigo, AiFi) are at a disadvantage? I’d argue that this validation is actually an accelerant as traditional retail struggles to keep up. How can traditional retailers fight back? Get more proactive. Don’t wait for Amazon to show you what the next best-practice in retail should be. There’s plenty of exciting technology you can adopt today to beat Jeff Bezos to the punch. Take Relex, a Finnish startup using AI and machine learning to help brick-and-mortar and e-commerce companies make better forecasts of how products will sell. Or companies like Memomi or Mirow that are creating solutions for a more immersive and interactive offline shopping experience. Amazon’s one-two punch strategy seems to be working. Traditional retailers are largely blinded by the behemoth’s warehousing innovations, just as they are about to be hit with an in-store innovation blow. New technologies are emerging to help traditional retail rally. The only question is whether they’ll implement the solutions fast enough to stay relevant. Amazon has finally given up the fight with Chinese online shopping giants to capture the domestic market. On Thursday, the Seattle-based ecommerce company announced it will shut down its marketplace on Amazon.cn, which connects mainland Chinese buyers and sellers, while other units of its local venture will stay intact. “We are working closely with our sellers to ensure a smooth transition and to continue to deliver the best customer experience possible,” an Amazon spokesperson told TechCrunch, adding that this segment of the business will end on July 18. The partial retreat, first reported by Reuters and Bloomberg, is indicative of the relentless ecommerce race in China where Alibaba and JD.com dominate, with newcomer Pinduoduo closing on the incumbents’ heels. But this is hardly the end of Amazon’s China story. The American giant has over the years attracted waves of cross-border sellers, many of whom have hailed from China’s traditional export industry looking to sell cheaply manufactured goods to consumers around the world for lucrative margins. To date, Chinese export suppliers are able to sell to 12 countries that include India, Japan, Australia, Canada, the United States, and five Western European countries. Other global ecommerce players also have their eyes set on the massive raft of goods flowing out of China, though each comes with a different geographic focus. Alibaba-backed Lazada, for example, is the bridge between Chinese merchants and Southeast Asian shoppers, while Jumia, which just listed in the U.S., exports from China to Africa. “The biggest appeal [of exporting through Amazon] is the low costs because we are close to a lot of supply chain resources,” a Shenzhen-based vendor selling water-resistant placemats on Amazon told TechCrunch. In the meantime, China has developed a big craving for imported goods as middle-class consumers now demand higher quality products. Amazon is in the import business, too, although it lags far behind more entrenched players such as Alibaba, of which Tmall Global takes the lead with 29 percent market share in the cross-border ecommerce space according to data from iResearch, dwarfing Amazon’s 6 percent. That could change if Amazon finds a prominent local partner. Rumors have swirled for months that Amazon was reportedly in talks to merge its import unit with Kaola, the cross-border shopping business run by Chinese internet giant Netease with a 22.6 percent market share. Not to be forgotten, Amazon also offers cloud computing services to Chinese enterprises although, in this space, it’s again in a direct face-off with Alibaba Cloud, the dominant player in China. Lastly, China remains the largest market for Kindle, so pivotal that the e-reader launched a localized model just for China. Walmart is getting into subscription-based fashion with today’s announcement of a partnership with Kidbox — a sort of “StitchFix for kids” where parents receive a personalized, curated box of children’s clothing on a seasonal basis. The deal will see Kidbox offered to Walmart.com’s online shoppers, where they can fill out a short style quiz, then receive their box of four to five fashion items for around $48 — or 50 percent the retail prices of the bundled items. The boxes are available in Sizes 0 through 14 for girls and 0 through 16 for boys, and include styles like sweaters, denim, dresses, graphic tees, and more — based on whatever is seasonally appropriate. Kidbox today also has relationships with over 120 fashion brands, including BCBG, Butter Super Soft, C&C California, Puma, and others. Like other subscription fashion box businesses, Kidbox last year launched its own private labels, too, based on its understanding of consumer trends and interests. To determine what will sell, the company leverages data it gleams from things like the initial style survey, customer feedback, and by noting which items are most purchased or most returned, among other factors. “Walmart has done a lot over the past year to establish itself as a go-to retailer for all things fashion, and we’re honored to partner with the retailer to expand its kids’ assortment online, while also saving parents time and offering them the value and convenience of a stylebox,” said Miki Berardelli, Kidbox CEO, in a statement. “At Kidbox, we pride ourselves on understanding kids’ fashion preferences while also creating moments for them to learn about the importance of giving back,” she added. For Walmart, the partnership allows the retailer to enter into the subscription-based fashion businesses without having to build out its own service from the ground-up. Nor does it have to figure out the logistics involved with something like its own version of Amazon’s Prime Wardrobe, which heavily promotes in-house brands, but can be difficult to use since you can only shop Prime Wardrobe apparel — not all of Amazon Fashion. Walmart also sees Kidbox as a way to expand its growing children’s apparel assortment, which has added more than 100 brands over the last year, including Betsey Johnson, Kapital K, Levi’s, Limited Too and The Children’s Place. More broadly, it wants to further increase its investment in online fashion — whether that’s by hosting high-end retail like Lord & Taylor; offering branded storefronts like those from Bonobos or Nike; doing celeb collabs like those with Sofia Vergara, Drew Barrymore, Ellen DeGeneres, Kendall & Kylie; or by acquiring fashion brands like ModCloth, ShoeBuy, ELOQUII, and others. Walmart Kidbox shipments will also contribute to the subscription businesses’ “give back” program, where each box purchased translates to clothing given to a child in need, in partnership with Delivering Good. The partnership with Walmart follows Kidbox’s raise last year of $15.3 million in Series B funding to expand and scale its business. Canvas Ventures led the round, which saw participation from existing investors Firstime Ventures and HDS Capital, plus new strategic partners Fred Langhammer, former CEO of The Estée Lauder Companies Inc., and The Gindi Family, owners of Century 21 department stores. Kidsbox isn’t the only subscription fashion box business to turn to traditional retail in recent months. This February, Kidbox rival Rockets of Awesome took a $12.5 million investment from Foot Locker, which will sell Rockets of Awesome merchandise on its own website and in its Kids Foot Locker stores. Kidbox also competes with StitchFix, which has its own kids’ line and Amazon Prime Wardrobe, which lets customers shop for girls, boys or baby, in addition to adult apparel. Alibaba’s arch-foe JD.com has long prided itself on owning and controlling its logistics services: couriers are treated as in-house staff and paid a basic income. But that will end soon as costs keep piling up for the ecommerce giant. In an internal letter sent to the staff on Monday, JD founder and chief executive Richard Liu said the company will scrap basic salary for couriers as net loss amounted to 2.8 billion yuan ($420 million) in 2018 at JD’s logistics unit. “I don’t think any of our delivery brothers want the company to go bankrupt,” Liu added. JD Logistics became a standalone business in 2017 and subsequently raised billions of dollars from investors. JD still owns an 81.4 percent stake in the logistics arm, which was valued at around $13.5 billion at the time it raised $2.5 billion in February 2018. Going forward, JD Logistics will continue to pay social insurances on behalf of its couriers, whose income is now based on the number of packages they handle. Liu assured that the old basic pay accounted for just 10 percent of the delivery staff’s total income so his goal is not to cut but boost salary for them, and eventually for JD Logistics as well. But couriers are feeling the heat. Monthly pay used to average 7,000 yuan ($1,043) to 8,000 yuan, a Shenzhen-based courier told TechCrunch. Under the new scheme, he and his regional colleagues are earning 5,000 yuan to 6,000 yuan. Liu said in the letter that it’s “up to the couriers” to vie for better salaries, but it’s unclear how they can secure more packages in practice. JD said it has no comment on the issues addressed in Liu’s letter. JD delivery staff are assigned on a regional basis. Assuming the number of parcels that go out of a region stays relatively constant, couriers can’t do much to boost their piecework wage. Already, some couriers have devised cheats that involve mailing parcels to themselves and rejecting them at delivery in order to jack up income, TechCrunch has learned. China’s express delivery market, like many other fledgling industries, is a relentless race that sees players offer heavily subsidized prices for customers to stay competitive. JD is going against companies like Alibaba that enlist a consortium of third-party contracted couriers rather than hiring their own to keep costs down. JD’s fourth-quarter cost of revenues grew 20.7 percent to $16.8 billion, mainly driven by expenses related to logistics services alongside its online direct sales business, the company’s earnings report revealed. The Amazon-like service is finding ways to bulk up revenues by opening its logistics service to third-party clients as well as expanding overseas. “It’s just a matter of time that JD will remove couriers’ minimum income. It can’t increase the price for customers, so it’s passing the cost to the couriers,” said Alex Cheong, founder and chief executive of Web2Ship, a service that enables price comparisons across different express shipping services, told TechCrunch. “In China, the only thing [courier companies] can play is the volume game. There’s this mentality that as volume goes up, companies will get more efficient, and costs will lower. But growth is actually slowing,” Cheong warned. The income restructuring at JD’s logistics arm comes amid a widespread layoff across the parent company to remove low-performers, or what Liu labeled as “slackers.” JD is namechecked as one of China’s internet companies working 9 am to 9 pm, 6 days a week, or “996”, a demanding schedule that has prompted an online protest. JD denied that it practices the “996” routine though it sees itself as “a competitive workplace that rewards initiative and hard work” which is consistent with its “entrepreneurial roots,” a JD spokesperson told TechCrunch earlier. The ecommerce titan has long promoted its in-house logistics arm as offering “quality” service, so it remains to see how the removal of basic income will affect couriers’ morale. But one thing is for sure. Under the piece rate system, JD knows its exact labor cost per unit and avoids paying for employees’ idle time. With a new chief executive officer and $4 million in fresh funding from investors including the Los Angeles-based investment firm, Upfront Ventures, Territory Foods is poised for growth. The company recently hired powerhouse executive Abby Coleman, the former vice president of marketing and strategy at Quidsi and head of e-commerce at Diapers.com as its new chief executive and is now looking to expand its footprint and unique approach to meal delivery beyond its current geographies. The company uses a proprietary food recommendation engine to determine its subscribers’ personal preferences to deliver them meals that are more tailored to their individual tastes. Territory also employs a unique business model, leveraging local chefs to prepare meals according to menus designed by the company. The distributed workforce of gig chefs allows the company greater flexibility in planning, preparing, and distributing its meals, according to Coleman. A lifelong vegetarian and mother of two vegetarian daughters, the 39-year-old Coleman actually began her business in the food services industry as a caterer before moving on to leadership positions at Kraft Foods and Mondelez International before taking on the vice presidential role at Quidsi. “My coming on board was really a response to a decision that the board and Patrick [Smith] made that it was time to scale the business,” says Coleman. With the new cash the company intends to expand its footprint in locations beyond its hubs in major cities on the East and West coasts (and Texas), including: Baltimore, Dallas/Ft. Worth, Los Angeles, San Francisco, and the Washington metropolitan area. There’s plenty of opportunity for growth considering that the market for healthy eating and personalized food is roughly $702 billion, according to the company. In 2018, one out of every three Americans reported to following some kind of healthy eating protocol with the percentage highest among 18-34 year olds, according to information provided by Territory. Indeed, the company’s methodical approach to growth has been a strength that has led it to profitability in core markets like Los Angeles and Washington, Coleman says. Territory wrings efficiency out of its network of chefs, which has a high retention rate and allows the company to act in an asset light way. Chefs are paid to prepare the meals, but provide the ingredients themselves and work as contractors rather than employees. They pocket the difference between the cost of the ingredients they use and the price they’re paid by Territory to prepare the meals. Coleman says the business model leverages the excess capacity caterers have while offering them the opportunity to tailor their meals to suit local market tastes. And just because the chefs are given a bit of free rein doesn’t mean that there’s any lack of quality control, Coleman says. “The emphasis is on the quality control that a product is up to our standards,” according to Coleman. Meals are $10.95 and are designed around the needs of customers — ranging from paleo, whole 30, keto, and vegetarian options. Now, Coleman is looking to aggressively expand the flexibility and menu options available to customers. Despite the woeful performance of public companies like Blue Apron, prepared food companies are still attracting investor attention and interest — especially if they’re married with a pitch to health-conscious consumers targeting a specific diet. Territory Foods has raised $20 million to date, including the new cash from Upfront Ventures and Lewis & Clark, while Trifecta, another purveyor of prepared foods has raised $2.6 million. And the giants are still around as well, the companies like Plated, HelloFresh, Home Chef (owned by Kroger Foods), and Sun Basket, which have raised over $500 million combined. Amazon has a large and growing advertising business, but rival Walmart’s own ad business is much smaller. It’s now working to change that. Earlier this year, the retailer consolidated ad sales for its stores and websites and said it was ready to start monetizing its shopper data on a grander scale. Today, its efforts continue as Walmart says it has bought the advertising technology company, Polymorph Labs, to help it better compete via online digital ads, targeted using shopper data. The San Francisco-based startup’s technology and assets will allow Walmart to deliver more relevant ads to online shoppers, the retailer says. Meanwhile, Polymorph’s team will join Walmart’s in-house advertising business, the Walmart Media Group. Specifically, Polymorph’s technology includes a high-speed ad server, a self-serve interface, and server-side header bidding. This, says Walmart, will make advertising easier for thousands of brands and will deliver more relevant ads to consumers — and quicker than typically possible because of Polymorph’s “much faster” client-side server. The technology complements Walmart’s existing ad tech investments, including its omni-channel ad targeting and measurement solution, and will allow it to later expand into new areas like real-time auctions across multiple pricing models (cost per click, cost per impression, and cost per conversation). At Walmart, Polymorph’s technology will allow advertisers to target segments based on shopping behavior. For example, an advertiser could choose to target a cat food buyer instead of a dog food buyer, then automate ad delivery and measure whether those ads led to sales. The acquisition comes only months after Walmart brought its ad sales in-house, in an effort to build out a bigger advertising business. The move also allows big suppliers — like P&G, Unilever, and Mondelez — to interact with one ad team instead of different groups within and outside the retailer. It also allows advertisers to leverage a unique combination of in-store and online shopper data from Walmart’s hundreds of millions of customers, making ad buying more efficient. The acquisition comes at a time when Amazon has been rapidly growing its ad revenues by allowing merchants to pay for better placement in search ads. In February, research firm eMarketer upped its estimates as to how large Amazon’s ad business had become, in fact. It said that Amazon’s ad revenue had totaled $3.3 billion for 2017, up from an earlier estimate of $1.9 billion. And it said Amazon was on track to increase its ad revenues to $15 billion by 2020. Walmart, on the other hand, has admitted its ad business is small by comparison. Walmart says 90 percent of U.S. consumers shop at Walmart every year and its stores and websites see nearly 160 million visitors every week. Next month, Walmart says it’s hosting “Fifty-Two Sixty,” an event where CMOs, agency folks, and senior brand marketers will hobnob with Walmart execs to talk about brands should be thinking about their retail strategies. Polymorph Labs was founded in 2013, and had proven its ad tech over the past five years, Walmart notes. Previously known as AdsNative, Polymorph Labs had raised $10.6 million from Rakuten Ventures, Interwest Partners and Onset Venturesi, according to Crunchbase.